Well, my nice DNS service with two secondaries and a primary is all well and good, but my logs are now scattered across three machines. If I want to play with the stats or diagnose a problem or see when something went wrong, I now have to grep around on three different machines. A side benefit of using syslog to accumulate my dns logs is that they’ll now be timestamped so I can do more sophisticated data analysis if I ever get a Round Tuit. Declare a “facility” in syslog that DNS can write to. For historical reasons (Hi, Eric!) syslog has a limited number of separate facilities that can accumulate logs. The configuration file links sources to facilities, allowing the configuration master to do various clever filtering of the log messages that come in. Restart both bind9 and rsyslogd to get everything working. The logging for Bind9 is specified in a file called at /etc/bind/named.conf.local. The default setup involves appending log records to a file named /var/log/named/query.log. We’ll keep using that file for our logs going forward, since some other housekeeping knows about that location and no one else is intent on interfering with it. Because I have decided to use the facility named local6 for DNS. In order to make the rsyslogd daemon on flapjack listen to messages from DNS, I have to declare the facility active. The syslog service on flapjack is provided by a server called rsyslogd. It’s an alternative to the other two main stream syslog products – syslog-ng and sysklogd. I picked rsyslogd because it comes as the standard logging service on Ubuntu 12.04 and 14.04, the distros I am using in my house. You might call me lazy, you might call me pragmatic, but don’t call me late for happy hour. 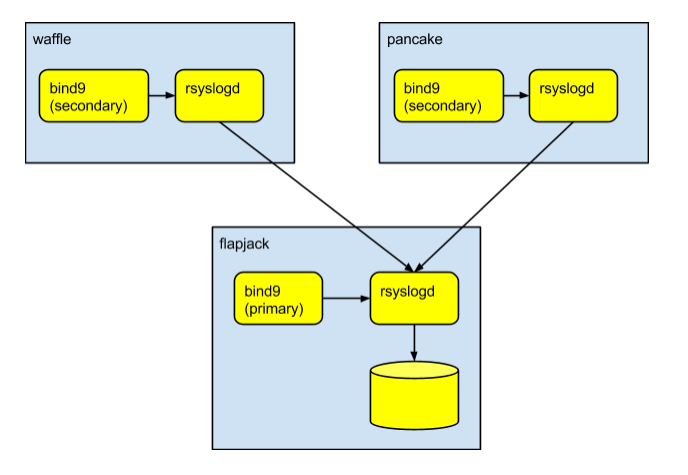 Actually, this Makefile ends up in ~/projects/r/rsyslog/flapjack, since waffle and pancake will end up with different rsyslogd configurations and I separate the different control directories this way. With a restart of each of the appropriate daemons, we’re off to the races and the new logs appear in the log file. I needed to change the ownership of the /var/log/named/query.log from bind to syslog in order for the new writer to be able to write, but that was the work of a moment. Now comes the task of making the logs from the two secondary DNS servers go across the network to flapjack. This involved a lot of little bits and pieces. First of all, I had to tell the rsyslogd daemon on flapjack to listen to the rsyslog UDP port. I could have turned on the more reliable TCP logging facility or the even more reliable queueing facility, but let’s get real. These are DNS query logs we’re talking about. I don’t really care if some of them fall on the floor. And anyway, the traffic levels on donner.lan are so low that I’d be very surprised if the loss rate is significant anyway. One more restart of rsyslogd on flapjack and we’re good to go. The next step is to make the DNS name service on waffle and pancake send their logs to the local6 facility. In addition, I had to set up rsyslog on waffle and flapjack with a local6 facility, though this time the facility has to know to send the logs across to flapjack by UDP rather than writing locally. The change to the named.conf.local file for waffle and pancake’s DNS secondary service was identical to the change to flapjack’s primary service, so kudos to the designers of bind9 and syslogd for good modularization. Notice that the @ tells rsyslogd to forward logs to local6 via UDP. I could have put the IP address of flapjack right after the @ or I could have put in flapjack. Instead, I created a DNS listing for a service host named syslog … it happens to have the same IP address as flapjack, but it gives me a level of indirection if I should desire to relocate the syslog service to another host. With a restart of rsyslogd and bind9 on both waffle and pancake, we are up and running. All DNS logs are now consolidated on a single host, namely flapjack.